Applicable to: Office 365, 2019, 2016, 2013; Windows 7 & 10 and MAC OS X operating systems. I am trying to figure out macro development from going through some simple examples written in VBA. I figured out that some of the examples point out to the developer menu in Microsoft Excel. For some reason, i don’t see that menu item in the Excel ribbon. Am i missing out something? Is there any specific setting or configuration to make the Developer tab visible? As we explained in the past, the simplest way to automate tasks in Microsoft Office applications (Excel, Word, PowerPoint, Outlook, Visio and Outlook) is using Macros. Excel, Word and Visio ship a built-in Macro recorder that allows you to capture a specific sequence of actions and re-use them later on. Recording macros might be good for starters, but most probably you will be using Visual Basic for Applications (VBA) to write your own custom Macros. On top of that, popular applications like Outlook and PowerPoint do not offer the macro recorder so you’ll need VBA chops if you want to automate a presentation or a mail message. The best way to access the VBA developer environment, is the so-called Developer tab. The tab is turned off by default in Microsoft Office, but you can learn how to set it up in a breeze. First off, open your Office application. In this walk through i have focused on Excel, but the process for the other apps is quite similar. Place your mouse on the Ribbon and hit your mouse right click menu. Then go ahead and hit Customize the Ribbon. Next, go ahead and check the Developer entry in the right hand side column, as shown below. You might at this point choose to show or hide the different sections of the Developer tab (Code, Addins, XML etc’). Leave those checked (visible) if you are a relatively newcomer into Macro development. Microsoft Office for MAC OSX has ships tools for Macro recording and development. Open the relevant Microsoft Office application, be it Word, PowerPoint or Excel. Hit Macros… in order to access your presentation/workbook or document macros. Note: Currently (Office 365), Outlook for MAC OS X still doesn’t support Macro development. Applicable to: Office 365, 2019, 2016, 2013, 2007. Windows 7 and 10 operating systems. “I work as an analyst and have a significant number of old xls files were created in the previous version of Excel. Now that i have upgraded to the new version, Excel 365 won’t open the existing files telling me that they are corrupted and can’t be opened. Is there any possible way to associate or convert Excel 2003 files to version 2016, so they’ll open up correctly? I have invested significant amount of work in those files and would hate starting from scratch :-(. Many readers have asked us about how to troubleshoot compatibility issues between older Office versions and the existing version 2016. In this post we’ll discuss what to actually do if Excel is not opening your existing xls format files or won’t save changes to your existing spreadsheets into a new format. Although we have written the tutorial specifically for Excel, the procedure below is fully applicable to other relevant Microsoft Office applications such as Word, PowerPoint and Visio. Open Microsoft Excel 2016, hit File and select Options. In the dialog box select Trust Center and hit on Trust center settings. Select Protected view on the left, uncheck all the options under Protected View and select OK.
Now restart Excel 2016 and try to open Excel document. Compatibility Mode allows to convert Office files so they become usable in later versions. It changes the layout of your document or spreadsheet. Your old spreadsheet will go through the conversion process and modified to version 2016/2013. 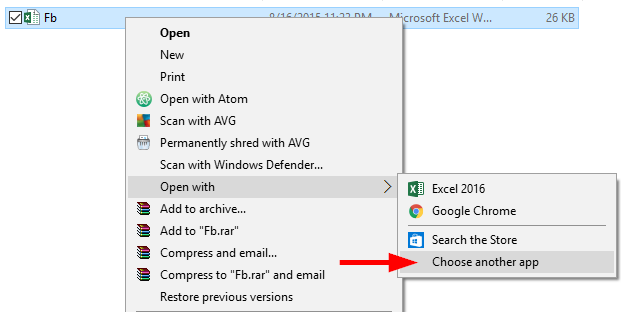 Open Excel 2016, click on File and select Options. Click on Save on the left and in the Save files in this format drop down box, select Excel 97-2003 workbook. Now the default save format option for Excel documents will be as a xls file. 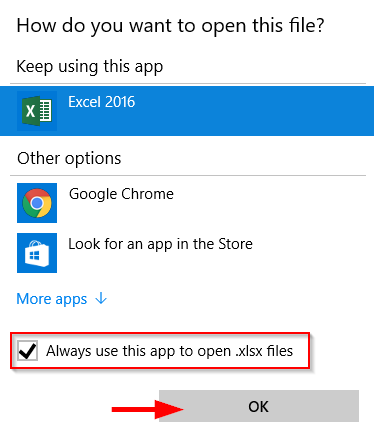 Voi’la you are able to open older Excel versions in Excel 2016. Got a related question ? See our quick guide on how to get your Excel questions answered. A reader was asking about whether we know of a method or formula to highlight every other row and column in Excel. 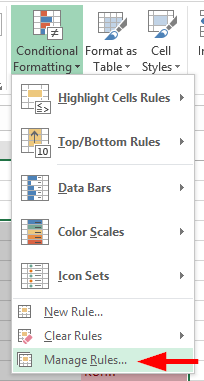 Today, we’ll learn how to apply different color schemes to alternate rows or columns in Excel. There are several ways to alternate row colors, but today, we will focus on two main ways to do that: using conditional formats and using table designs. At first we need to select the rows that should be shaded using conditional formatting. Now go to the home ribbon, click on the drop down box of conditional formatting and select new rule. In select a rule type, hit use a formula to determine which cells to format. In the format values where formula is true, enter the formula =mod(row(),2)=0. Then click on the format, go to fill and set a background color (I assigned it to green). The formula describes when modulus of row (1 to n) divided by two = zero fill the background color green. Modulus is the remainder value in a division. So from the selected rows 2,4,6 will have the background color green. Thus alternate rows shading with conditional formatting can be done. We can also use table style format instead of using condition formatting. To do so, select the cells that has to be formatted and click on Format as table in the home ribbon and select anyone of the needed table format. If u already have a header in the selected cells, check on the My table has headers. In the table style options, we can check or uncheck on the options provided. Filter buttons will provide you with drop down symbol. First column will make the fonts bold in the first column. Last column will make the fonts bold in the last column. Banded columns will make alternate columns shaded. Headed Row will make the headed hide or visible. Total Row will calculate the total number of rows in the spreadsheet. Banded Rows will make alternate rows shaded. Automatically format cells, dates, columns and rows in Excel 2016? Great question. In this post we will show you how to add the auto format menu in the ribbon, working with auto format and format dates and times in Excel 2016. Open your Excel 2016, right click on the ribbon and choose customize the ribbon. Add a new tab and create a new group in the main tabs option. In choose commands from drop down box, select All commands. Scroll through to the Auto format entry, select it and click Add. Open the Excel document which has to be auto formatted. Select the cells that are needed to be formatted and click on Auto format from the toolbar or the ribbon. Now click on your needed format and hit OK. If needed we can customize the format by click on the options. Numbers are used to add the numbers with dollar symbol or with decimal value. Borders are those borders in between those cells. Font helps to use text in bold letters with increased size. Patters are the design patterns that can be used in the headings. Width/Height increases the selected cells width and the height. Format cells is the one where each cells can be formatted separately. Like a single cell number, alignment, font, border, fill, protection. Here’s an example to format date in a cell. Enter the date, right click on cell and click format cells. In number, select category as date and click on anyone of the date formats. Got additional Excel questions? Look into our guide on how to get your Excel questions answered. How to easily create checklists in Excel sheets and Word documents? Applicable to: Word and Excel 2019, 2016, 2013, 365. Microsoft and Apple Office versions. Chances are that from time to time you might want create forms using in Office in order to easily capture user feedback or document a standard operating process. In today’s tutorial, we’ll teach you pretty much everything you need to know in order to create and format tick box lists either as part of your Excel spreadsheets or Word documents. Once done you might want to use your checklist as a template. The tutorial below refers to Office 2016 applications, however it is relevant to 2019 and 2013 versions as well. Note: The developer tab allows you to access many useful controls that you’ll use when creating your form. You will need to enable the developer tab for each Office Application you’ll use. Open Microsoft Word or Excel, click on File and select Options. Open Customize Ribbon tab and select Main tabs option under Customize the Ribbon. Click on Developer option and press OK button. Once the Developer option is clicked it will be displayed as additional menu on top of the screen with several developer options. Write your tasks in column A as shown above. Under Developer option click Insert and then click check box which is placed under form control . Select the required cell to place the check box. To remove Check box 1, click on text and delete it. Click on the right corner of the cell and drag down till the last item of the list. Right click the check box and click format control. Link the check box to the cell next to it. If C 2 then Click on Cell link under control and type $C$2.Repeat the same for all check boxes. To count the number of items marked insert a COUNTIF function next to the last item of the list. Insert IF function at the end of the list. The user has to create the check list and click on Check Box Content Control under developer option . The same process should be repeated for the list of items. Got a related question? Look into our guide on how to get your Excel questions answered. How to combine two or more cells or columns in Excel 2016? Sure. Read on for the details. Open the spreadsheet to which your column has to be merged. Using an example we will discuss about using concatenation function. In this example the first name and the last name has to be merged in the full name column. In the C3 column type =CONCATENATE (A2, ” ” ,B2). Here A2 is Vinod and B2 is Mvd. The ” “ represents a space between A2 and B2. Now we can see the merged name. After this just drag the green bottom pointer to the end of the names. Using the auto fill functions we can easily merge names into one column. No need of using the formulas. 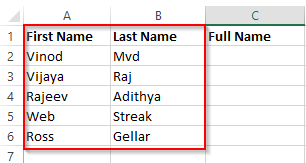 Just by entering the column number we can merge the names in one cell. Read further for the procedure. Open your spreadsheet and place the cursor click on the blank space where the names has to be placed. Now, click on Home in the ribbon and select the drop down box of Auto Sum in the Editing menu. Select more functions, in the select category click All. Search for concatenate function and click OK. In the text 1, select the column by clicking on the icon in the text box. Similarly for other text columns and select OK to merge the columns. That’s it. 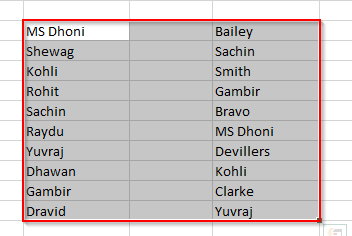 This is how we can merge names in same column. How to remove duplicated entries from an Excel 2016 list? If you use Excel to analyze large data sets, you might have encountered the need to find and remove duplicate rows from your data. In today’s post, we’ll provide a simple tutorial to help you find those duplicates and scrub them from your data. Although Excel 2016 is used to outline the steps below, they are fully applicable to Excel 2013 as well. 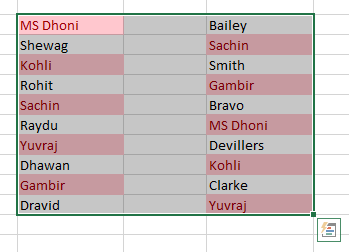 Open the spreadsheet and select the range in which you need to find the duplicated entries. In your Home ribbon, select the drop down box of Conditional formatting. Then move your cursor over the Highlighted cells and hit Duplicated values. Now you can see that all the duplicated entries in the selected cells will be highlighted. In the Home ribbon, select the drop down box of conditional formatting and select Manage rules. Click on Edit rules in the selected formatting. Select the rule type accordingly to your need. Select Duplicate in the format all drop box to highlight the duplicate entries. Select Unique in the format all drop box to highlight the unique entries. Click on the format box to modify the font size, color, underling and effect and click OK in both dialog boxes. Warning: please make a copy of your original spreadsheet before removing any data! Select the cells in which the duplicates has to be deleted. Now, select Data in the ribbon and select Remove duplicates in the data tools menu. Make sure the columns are selected and click on OK to remove the duplicate entries. Check on the columns which are needed to be check for duplicate entries. How to add a drop-down menu for data validation in Excel 2016? Capturing user input using drop down menus in your Excel spreadsheet can be leveraged as a very powerful data validation technique. In today’s tutorial we’ll take you through the process of creating the drop down menu, validating user input and showing an error message if a invalid data is entered. Read further for the procedure. Open your Excel spreadsheet, then select the cell where drop down menu has to be inserted. 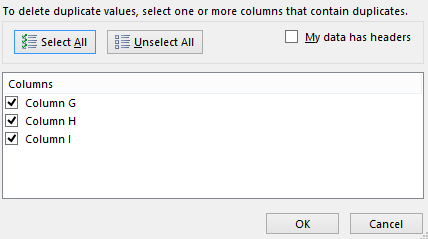 Now, click on Data in the ribbon and select Data validation in the data tools menu. Click on the Allow drop down menu and select List. In the source, enter the values which has to be displayed in the cell drop down menu. We can also enter the values for the source by click on the icon right to source and select the cells with different data’s. Click OK to insert a drop down menu. To insert a input message when the drop down menu cell is clicked, click on Input Messages in the data validation dialog box. Make sure the “Show input message …” box is checked on. Then, enter your user dialog title and the information in the space provided and select OK.
To show a error message when an invalid data is entered in the drop down menu cell, click on Error Message in the data validation dialog box. Make sure the “Show error alert …” box is checked on. 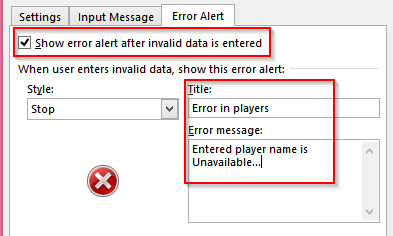 Now enter the title and the error message respectively to be displayed if an invalid data has been entered. Also we can insert the style symbol with the error message like Stop, warning, information symbols.